Remember this major scandal of the Carter administration? In late 1978 and early 1979, Billy Carter visited Libya three times with a contingent from Georgia. He eventually registered as a foreign agent of the Libyan government and received a $220,000 loan. (Edwin P. Wilson claimed he had seen a telegram showing that Libya paid Billy Carter $2 million.) This led to a Senate hearing on alleged influence peddling which the press named Billygate. A Senate sub-committee was called To Investigate Activities of Individuals Representing Interests of Foreign Governments (Billy Carter—Libya Investigation). On August 4, 1980, President Jimmy Carter wrote: "I am deeply concerned that Billy has received funds from Libya and that he may be under obligation to Libya. These facts will govern my relationship with Billy as long as I am president. Billy has had no influence on U.S. policy or actions concerning Libya in the past, and he will have no influence in the future." He didn't have any influence on Libya policy. Obviously. Billy was a very small time hustler who didn't know Libya from Connecticut and nobody ever thought the president would actually listen to anything he said. There is no doubt that Saudi officials have been playing with brother Jared in a big way, for a lot of reasons. There is evidence they even ran a blockade against American ally Qatar, with Trump's approval, to pressure the Qataris to lend the Kushner family a boatload of money. By all accounts Joshua Kushner is not his brother and is antagonistic toward Trump. But I'd guess that didn't get in the way of trying to make a deal knowing his brother was deep in the Saudis pocket. Nothing personal, strictly business. 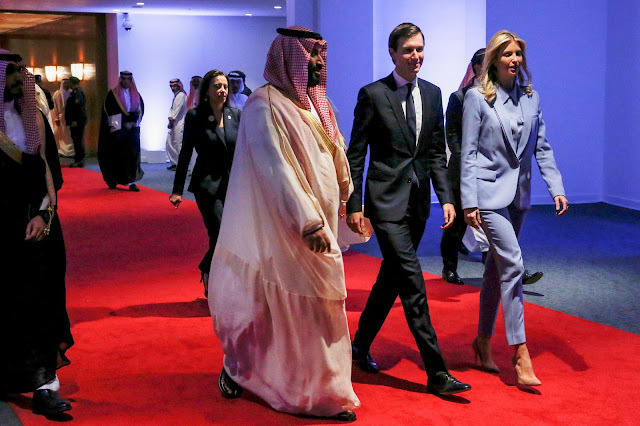 Trump, Ivanka and Jared refused to divest themselves of their global businesses with billions of dollars putting American national security at risk. Jummy Carter, on the other hand, was forced to sell his family's peanut farm so as to ensure there was no appearance of conflict of interest.